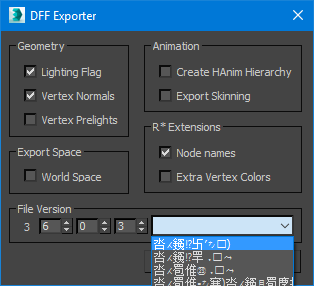 I've been working on a dff importer (EDIT: and exporter) based on librw for 3ds max recently. I think I got to a point where I can release a first version. It should work with 3ds max 2009, 2010, 2011, 2012, 2014, 2015, 2016, 2017 and 2018. I created a new material and provided a converter to Kam's material as I don't have an exporter yet. This material is a more or less accurate copy of the official RwMaterial. Not all things are supported yet but you should be able to import pretty much any GTA dff from any platform. That does *not* include iOS LCS dffs (yet) as they're not proper dffs. 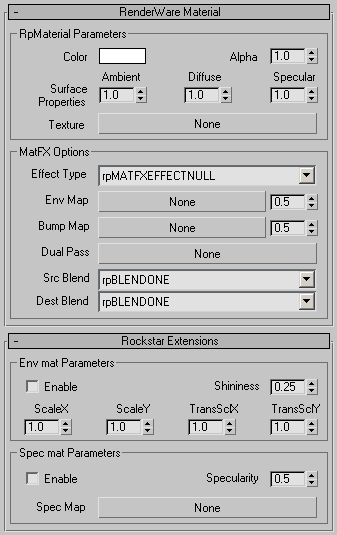 Note that models exported by Kam's script don't get different materials per mesh as Kam exports material IDs wrong. I will correct this in a future version but was too lazy to do it now. EDIT: As of version 2.0 there is an exporter now as well. Not everything that is imported can be exported yet, but I wanted to get this thing out. See the README for some more information. EDIT: Just a comment on the "convert axes" option: In RenderWare the usual convention is for the y-axis to point up while in max z points up. Hence the official exporter rotates the hierarchy 90 deg around x. In skinned DFFs this seems to be exactly what we're observing but all other DFFs are not rotated. I don't know why that is, maybe R* wrote a custom version of the exporter that doesn't do this or something, really no idea. Anyway, I left it as an option to the user to convert the axis system back on import. The "convert hierarchy" option should be left on. When exported in world space the official RW exporter rotates everything so max's z-up will match RW's y-up world. Models that were originally exported from max's biped objects are exported "lying down" when not exported in world space. This option rotates them so it'll look nicer. Perfect job aap, really good. Added plugin for 2009 amd64. Will it support multiclump export? You mean for CJ player models? Not sure yet. III and VC DFFs all have just one clump. In SA only CJ player models have multiple clumps (always 3, slim, fat, muscular). If you mean multiple atomics then yes, of course they're supported (or rather will be). Peds in gta3 are multiclump, aren't they? No. Just a bunch of atomics. EDIT: disregard that, see below. The 2nd clump is just a LOD model. It's useless anyways since the game can load one from the generic folder even without that LOD clump. EDIT: Kinda ninja'd by The Hero. Either way the LOD inside peds is pretty much useless. Edited January 16, 2016 by Jinx. Oh wow, I was actually wrong about the peds, there *is* a second clump o_O Never seen that, I always do my tests with player.dff. You mentioned that the iOS version used .dff models of a different sort. Is it really Renderware or just the Leeds engine with meshes having different file extensions for no reason? It's the Leeds engine, which is heavily based on RenderWare. It looks like they didn't write it very carefully, they have a bug in their DFF reader which shows that somebody really had no idea what he was doing, I already sent a complaint mail telling them about this idiotic code (which only works coincidentally) but got no response. So the Stories engine is more or less an RW fork then? And not to mention that they did a rather lame attempt with the fonts as well. 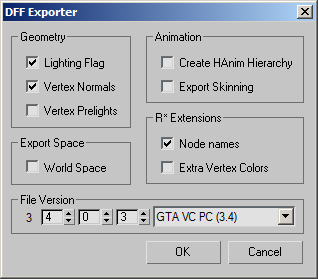 Now that it's been exactly 11 years since I registered on this forum I think it's a good opportunity to release the first version of the exporter I've been working on in the last week. It's still a bit rough but the most important stuff should be working. EDIT: Note that i haven't tested everything in game (only VC player.dff really). Report any bugs you encounter. Hmm, let's see if converting a vehicle using this tool would work just as fine as with Kam's. Not to mention that Zmodeler DFFs are somewhat different and thus required a small tool for them to be imported in Max. No support for x32 3ds Max? No, sorry. What version do you need...perhaps I can compile a 32 bit version.